This is the inaugural March to End Slaughter in Hobart. It coincides with marches in Melbourne, Sydney and Adelaide, and the international March that began in Paris about 10 years ago, and has spread to cities around the world. 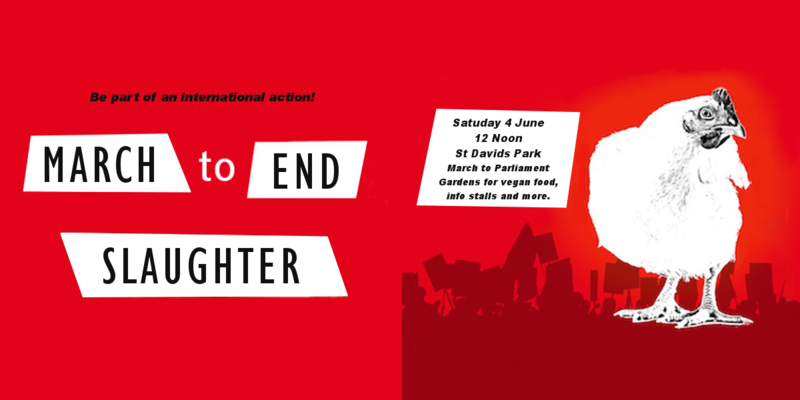 Although the official event title is March to Close All Slaughterhouses, the associated event material calls for meat & dairy abolition, and farming, fishing and hunting of animals to be abolished. The March will start at St David’s Park near the corner of Sandy Bay Rd and Davey St. We will walk from there for several blocks and return to finish at Parliament Gardens. For consistency, people attending are asked to wear red T-shirts, or black if you don’t have red. Read more about this event at: https://stopabattoirs.org/ (international site) and http://www.mtcas.org/ (Canada). This year some marches around the world will be held on 4 June, and others on 11 June. Australian marches will all be held on 4 June. Stay tuned for more details, and please share widely. Lets give this event some real impact by showing up in force! Why dont you just have a vegan march since the nonvegan public are the drivers of demand for animal use and without them there would be no slaughterhouses. Why are so many groups in Australia afraid to put veganism up front and centre?